"LaFond writes like an angel with a razorhe is careful and precise, but with a light touch and an accurate eye for what will entertain and delight as well as inform and enlighten." War and Agony: The Martial Arts of Hellas from Achilles to Khilon, 1220 to 323 B.C. and in answer the fastest drivers surged forward. It is possible that chariot-racing was the first Olympic sport*, and it is well-known that chariot-racing was the most popular mass-entertainment in the age of Rome. However, the variety of rigs entered in various Olympics and the heavily-financed super-carts of the Roman circus are not important to this discussion. What is of interest for those of us studying the evolution of prize-fighting arts in ancient Greece, is the nature of the war-cart depicted in Homer's Iliad. The Homeric chariot seems to have been of the light two-horsed variety used by the Minoans. This buggy was easily transported by sea in small ships as a "kit". It was a light, easily crated vehicle somewhat analogous to the U.S. military's jeep of the World War II and Korean War era. Its Roman counter-part was the biga, a light civilian transport used for municipal transportation in late antiquity. This is not the 4-horse-power race-car of Ben Hur, or the heavy scythed war-cart employed by the Great Kings of Persia. The vehicle in question is a light 2-horse-power rig, piloted by a skilled driver who, if he engaged in combat, only did so as a rescue pilot or as a casualty. What is the significance of such a chariot to the evolution of the combat arts? This apparently trivial question is actually quite important, for boxing only appears in the ancient world after the appearance of the war-chariot, and all-power-fighting evolved [in part]from boxing. To determine if this occurrence is coincidental or causal, one must consider the war-fighting capacity of such a machine. But first let us examine the Homeric military which utilized the war-chariot. The "armies" of The Iliad are in essence nothing more than bands of pirates and bandits that demonstrate a primitive level of group cohesion more reminiscent of modern street gangs than of modern military units. 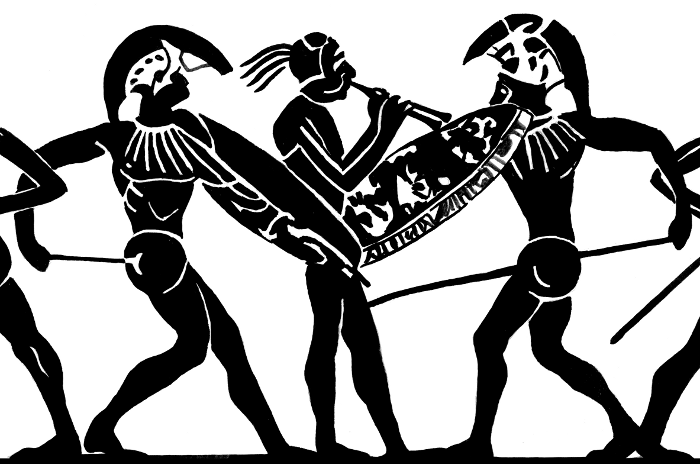 The armies of The Iliad are feudal conglomerations headed by chieftains who behave more like gangster rappers fighting over "hip-hop honeys" than captains fighting for strategic and tactical objectives. In this context, the importance of this curious personal vehicle becomes clear. The chariot only thrives as a weapon in an environment where horses are two small to be ridden individually, and began fading from the battlefield just after the composition of The Iliad. 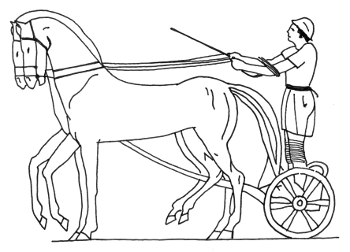 A chariot was never an effective shock weaponand shock** was the element that won ancient battlesbecause of the poor maneuverability of fixed-axle vehicles, and because the power supply [horses] was entirely vulnerable to enemy weapons due to an exposed position in front of the actual weapons platform. These considerations leave three possible effective uses of the light chariot as an engine of war: as a missile platform, that might be halted a bow-shot from advancing infantry just long enough to loose a volley of arrows before repositioning [the WWII scout jeep with mounted machine gun comes to mind]; as a mobile command post as depicted in the 2004 movie Troy, starring Brad Pitt; or as a means of transporting a heavily armored foot-soldier to and from a battle or duel. This last seems to have been the Homeric use of the chariot. In a war of personal challenges and muscle-powered combat, the ability to show up fresher with heavier gear than your foot-slogging opponent would constitute a significant advantage for the chariot-borne warrior; effectively putting the wealthiest fighters in a class of their own. In this way, such a device for inserting and extracting highly effective fighters into and out of battle, would encourage dueling on a grand scale. In such a martial atmosphere boxing might well become a pastime second only to chariot-racing, for dueling with ancient hand weapons necessitates the ability to circle your opponent [individual behavior at odds with the mechanics of mass battle.] The shorter one's weapons, the more pressing is the need to circle. Just as modern boxers enjoy advantages over modern fencers when the two meet in bouts with ancient weapon systems, ancient boxers most certainly fared better on the dueling ground than in the push and grind of mass battleand the chariot was a warrior's ticket away from the press of battle to the coveted dueling ground where risks were more tolerably focused and honor amplified. First and foremost is the presence of numerous parallels in the Epic poetry of Greece and India, most notably between The Iliad and the Ramayana. The many cultural affinities shared by the ruling classes of India and the Macedonian and Greek invaders led by Alexander included heroic foundation myths preserved in the forms of these epic poems, which tell the tragic tales of doomed chariot-warriors whom not even the gods can save from their mortal fate; the worship of many shared warlike deities; the institution of prize-fighting with fists; and a strong belief in combined-arms doctrine among military field-commanders, which was counter to the tribal nature of most ancient military doctrine. In fact, the notion of combined-arms tactics seems to have arisen with the chariot, which was a brittle high-performance asset requiring integrated support systems to maintain viability on the battlefield. The Hittites, who relied heavily on chariots and professional infantry, and appear to have been destroyed by the Sea Peoples, decorated the King's Gate of the royal city of Hattusha with a guardian warrior holding an ax and making a fist. Although chariot warriors of the second millennia B.C. were primarily archers, their secondary armament consisted of maces, axes and swords. The use of such short clubbing, chopping and thrusting weapons is echoed in much of the earliest boxing art, which indicates that the overhand hammer-fist was much more respected by these earliest boxers than by fist-fighters of any subsequent period. The most direct indication of martial influence [military, athletic and equestrian] from Western Asia or from a common Eurasian Hinterland is the legend of Pelops [Red-face]. Pelops was a legendary warlord from Asia Minor for whom the Peloponnese [Red-face-island], the very cradle of Greek athletics, was named. He is variously credited with having divine connections, being a victorious charioteer, founding the first Olympics, and fathering sons who went on to found the chief military and athletic centers of the Peloponnese. In a very broad and deep sense the ethics of chariot warfare continued to echo throughout the civic and military affairs of the greatest empires through late antiquity. The Etruscan and Roman practice of riding in a chariot during victory parades, despite the fact that these people did not use the chariot as a war engine, is telling. As is the practice of sacrificing a chariot horse common to both the Roman Emperors of Italy and the Gupta Kings of India. The huge social phenomena of chariot racing in Rome and the later Byzantine Empire, which remained infused with vicious politics and blood-thirsty racing tactics well into the middle-ages, is indicative of the deep-seated nature of man's obsession with his first true war-machine. The eminence of Apollo as the patron of these many intertwined aspects of suffering and triumph endemic to the life-way of the chariot-warrior did not escape the notice of Homer, and it should not escape ours. This is the definitive work in the field, backed by the latest archaeology and executed with rigorous scholarship. Throughout, the author makes clear that the optimal use of the chariot is as a mobile missile platform, which leads him to discount Homer's description of it is a "battle-taxi". However, in numerous instances Cotterell does put fourth evidence that the dominance of the chariot as a mobile archery platform was compromised by aggressive professional infantry before it was eclipsed by the horse-archer and other forms of cavalry. So, rather than discount Homer's description of chariot tactics as the misunderstanding of a poet, I would prefer to use the Celtic model for chariot tactics as observed by Julius Caesar in 55 B.C. during his invasion of Britain [as a close support vehicle and battle-taxi], and the example of Darius against Alexander at the battles of Issus and Gaugamela [as a command-car]. As Cotterell amply demonstrates throughout his work all of the Western Asian chariot armies except for the Assyrians [who added a heavy infantryman to their chariot teams] were hard hit by the fast-moving and aggressive infantry fielded by the Sea Peoples who ravaged the Eastern Mediterranean at the time of the Trojan War. These Sea Peoples who brought the empires of the Chariot Lords to their knees were the very same protagonists of Homer's epic, and quite possibly the fathers of Hellenic prize-fighting. Therefore, it is this author's conclusion that the descriptions of chariot use in the Iliad represent the attempts of a martial culture based on sea-raiding and hand-to-hand combat to adapt the high-status light-weight chariot to the very mode of warfare that had caused its demise. The author discusses the great number of diseases shared by cattle and humans caused from people coming to live in close proximity to these animals during the long process of initial domestication. The various forms of pox, such as cow-pox, chicken-pox and small-pox may be indicated. Small-pox was successfully put to use as a biological weapon by the British military against Native Americans during the war of Pontiac's Rebellion in 18th Century Pennsylvania. Cow-pox was eventually utilized to develop a small-pox vaccine in the 19th Century. The plague of Athens described by Thukydides in The Peloponnesian War, is suspected by some historians to have been the disease in question. From an Etruscan wall painting, Tomba delle Bighe, Tarquinia, c. 500 B.C. Note the slender well-bred mounts and the small delicate lines of the chariot; no battle car, but a racing vehicle descended from a one-man bronze-age troop transport. Those chariots used to transport a victorious athlete into his hometown may have been of this type. Achilles was the most important Hellenic martial archetype, more important than Herakles or even Zeus, Thunder-Chief of the gods. It was through the example of warriors such as Achilles, able to gain surprise and position due to their foot-speed and then being able to run-down defeated enemies, that the Greeks gained such a high appreciation for the sport of running. Running appears to have been the basic war-art of the Greeks. As strange as this assertion may seem it makes a lot of martial sense. The first and most obvious link between running and warfare is the preeminence of the spear in Greek warfare from the earliest to latest of times. As any fighting man knows mobilityfootwork if you willis integral to the timing and power of one's strikes, holds and counters. Historically the bow and the slashing sword and the lance have been employed by horse cultures. Cut & thrust swords and shoulder-fired weapons have generally served as the weapon-of-choice for those warriors who marched to battle. However, the javelin [throwing spear] and the thrusting spear was the preferred weapon of the running warriortypified by the ancient Greeks, the Slavs of the middle-ages, and the modern Zulus. The mechanics of swordsmanship, archery, axe-wielding and flexible weaponry are not compatible with running, as the runner's stride will ruin his stroke or shot. Also, any swings or cuts delivered by a runner will break his stride. The spear, and its cousins the pike and the javelin may be used effectively at a run, individually, and by massed warriors trained to run in step. The most feared warrior of myth was Achillesthe unmatched runner. The only spear-wielding warriors to defeat a modern rifle-armed army were the Zulus, who were greatly feared by their Dutch and English enemies because of their extreme running ability. The most feared military in Classical and Archaic Greece were the Spartans [Rope-Makers] of The Silent Land. But the Spartans most feared by all were the Skiritai, a battalion of 600 scouts, renowned for their running ability, recruited from the mountainous region of Arkadia. The measure of a spear-man's worth is the shock he can deliver to the enemy at the terminus of his charge and the terror his capacity to pursue will instill in the minds of a shaken or ill-prepared foe. Shock and pursuit are military roles which would be completely usurped by the horse-soldiers of late antiquity and the middle ages. But in a world of mountains, islands and small horses, a foot-soldier's foot-speed was paramount and would form the basic exercise of all combat athletes until the days of the Roman Gladiator. The stade [root word for stadium or race-course] or sprint prepared one for the charge, the double-sprint for pursuit, and the long-race for scouting and messenger work. The ancient footrace was no more a game to the ancient warrior than the march is to the modern soldier. From a Panathenaic amphora, Bologna, c. 440 B.C. The runners in the background are running in good form. The runner in the foreground has just received the palm of victory, which he holds in his left hand, and the victor's wreath or crown which he holds in his right hand. The contestants depicted are obviously boys, perhaps five feet tall. The victorious boy has the deep chest of a sprinter, and his build would probably have been common for elite athletes. relentless blows beating his forged cheek irons. Monomakhia [one-to-one-fighting] was possibly the longest continuous dueling tradition in human history. It is a vast subject in its own right which links more meaningfully with gladiatorial combat than with unarmed prize-fighting, although the two are often intertwined. The purpose of this brief piece is to illustrate the causes and effects that the practice of monomakhia had on the art of boxing. All martial cultures possess dueling and wrestling traditions. Boxing is a much rarer phenomena. Generally boxing emerges from dueling or from dueling and wrestling. The first modern boxing champion, James Figg, was a duelist, wrestler and boxer, and was apparently better at dueling than at the unarmed arts. The passage above might give one a sense for the appeal boxing had to the monomakhaist. Boxing as a preparation for helmet contact is an attractive possibility, since its usefulness has been demonstrated to the author on numerous occassions. * Below are some extracts from The Iliad which illustrate uses of the fist in armed combat as well as the oddest boxing match of mythic antiquity. The reader may judge for himself the importance of the fist to the Homeric duelist. ...I'm off to fight the man, though his fists are fire and his fury burnished iron! Hera boxed the Huntress' ears with her own weapons. In telling the stories of the boxers, ultimate fighters, pentathletes and wrestlers of antiquity we will occasionally be drawn into the lethal world of the duelist, until, with the tide of Christianity and barbarism that engulfed the pagan world of late antiquity, that dark art that gave birth to the unarmed prize-fighter would ultimately return to reclaim him. By this point in our journey we should already have a clear understanding that the duel is both the beginning and the end of boxing, and that the long-dead subjects of our study understood this intuitively as well as intellectually. *From 2001 to 2010 the author engaged in 618 documented full-contact stick fights with fire-hardened rattan rods for a record of 414 wins, 153 losses and 51 draws. The light hockey helmets used prevent skull fractures and lacerations but are not full-proof against concussionsespecially those resulting from rotational strikes to the temple and ear. It is the author's opinion that his boxing experience has aided him greatly as a stick-fighter, particularly when it comes to sustaining combat after taking head strokes. Scene from the Klazomenae Sarcophagus, 490 B.C. Pairs of dueling spearman appear on shields and funeral furnishings more often than on pottery. This particular pair of hoplites are unique in three respects: they fight to the accompaniment of a flute player; they are both using an under-handed grip; and the fighter on the right appears to be wielding a broken spearalthough the forward length of the weapon may simply no-longer be visible due to damage to or deterioration of the art work. This is a funerary duel or a phyrric dance celebrating such a duel. In any case it represents the very ritual that laid the foundations for boxing and gladiatorial combat. Fighting with the aspis and spear is extremely tiring and requires great shoulder strength. The round aspis weighed 20 pounds but was designed to permit it to rest on the shoulder, making it practical to use for extended engagements. The technical aspect most likely cultivated by successful monomakaists was the ability to threaten the head and strike the groin, and conversely to threaten the legs and then strike to the neck. The ability to switch grips from underhand to overhand was important. However, these fighters are probably varying pronated strikes to the high line and supinated strikes to the low line from the same underhanded grip, just as boxers of this period looked to throw the uppercut and the hammerfist from a hyper-pronated high rear-hand position. These spear-fighters demonstrate that boxing principal in reverse. The spring in the knees represents an effort to cover the thighs with the shield and also to keep the legs coiled for a leaping or looping pronated thrust down over the opponent's shield. but on his own he raised it high with ease. For the sixth event at the Funeral Games of Patroklus Achilles laid out a single prize, a lump of pig iron. The lump was something of a talismana war-prize. It had formerly belonged to Eetion, King of the Kilikians, a famous stone-thrower and father-in-law to Hektor. Eetion was, of course, slain by Achilles, and hence his great iron stone became an Akhaean prize. This iron mass was of great value in the bronze-age, and would also serve as the meansas well as the endsof contention. The prize was thrown farthest by Polypoetes who surpassed the marks of Epeus, Leonteus and the giant Ajax. Like the other missile weapon arts the diskus throw is treated as a minor event. Battles were won hand-to-hand. The stone would remain an important weapon in the hands of the slinger and the siege-engineer for many centuries. But the hand-hurled boulder appears to have been a weapon of prehistory that was never important enough to become standard equipment on the bronze-age battlefield. Stone throwing was, however, retained as a martial exercise, with the result that it became a sport, which further resulted in the throwing stone becoming lighter and more aerodynamic. By the 6th Century diskoi were cast of bronze in the characteristic disc shape, measured between six inches and a foot in diameter and weighed from three to fifteen pounds. Diskoi of the archaic and classical age were sometimes inscribed and dedicated as votive offerings and not intended for competition at all. They also served a political purpose as the signers of a treaty sometimes immortalized their pact on a sacred diskus. Competition diskoi were revered and dedicated to the god or hero of the game. Although the throwing of these rarified stones was a greatly admired art, the activity seems to have become divorced from any notion of war-preparation and to have become a pure expression of physical culture. However, a good throwing arm is not an altogether negligible asset for a boxer, and the hip torque of the classic discus throw may have been useful in the conditioning of wrestlers. Although it may be beyond our ability to fully appreciate the art of stylized stone-throwing as a preparation for the martial artist, we should not discount the possibility. Sure, the diskus throw may simply have survived as an eccentric game borne on some stone-age battlefield. But, let us not discount the ancients whothough many centuries deadare the subject of this investigation. 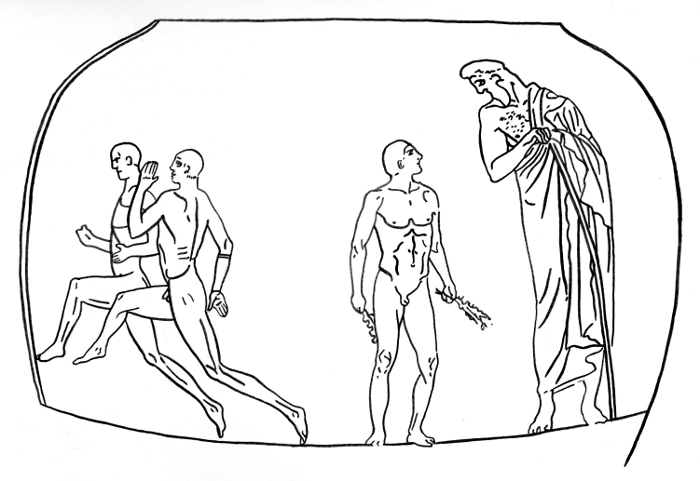 The diskus throw really meant something to the ancient Greek sports enthusiast as demonstrated by the fact that it was depicted in art as often as wrestling, boxing and dueling, and more often than any other martial art of the period. 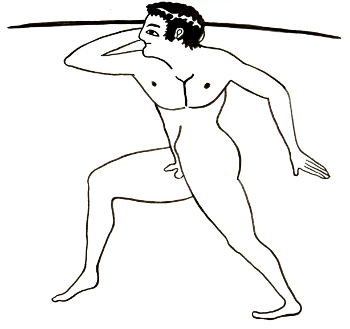 From an Attic amphora by Euthymides, c. 480 B.C. Note that Phayllos, though regarded as the consummate finesse athlete of his day, is depicted with powerful hips and thighs. He was the most famous and controversial long-jumper of antiquity, and is said to have heaved a discus 95 feet. The disk being hurled probably weighed between 9 and 15 pounds. A modern Olympic discus weighs 5 pounds. 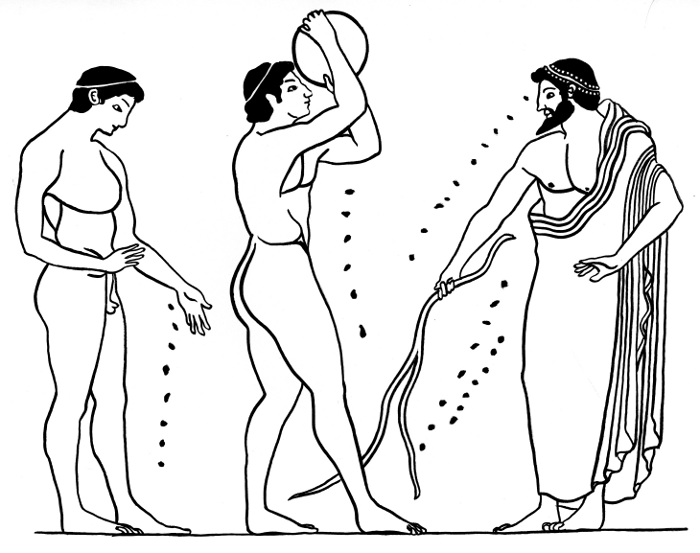 At the time when Phayllos made his throw discoi were evolving from 15 pound stone discs to 9 to 12 pound bronze discs. Phayllos was on the strong side for a pentathlete and appears to have won the pentathlon by winning the jump and discus and then defeating the victor or victors in the run and javelin throw in the wrestling. Based on the worth of the prizes [10 double axes to the winner and 10 singles to the loser] archery was still much respected in Homer's time. Archery features more in the exploits of heroes than in athletics [totally abandoned after Homer's day] because it was a lethal killing art, but not an art that won major field battles. Battles were won, and territory taken or protected by breaking the enemy's will and driving him from the field, not by killing. 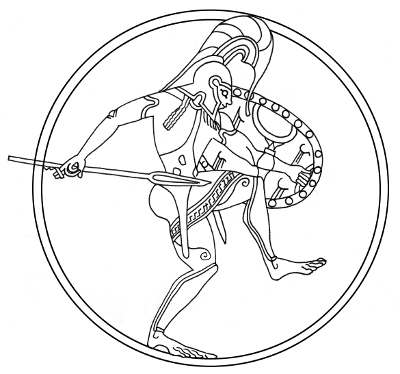 The respect for the individual prowess of the archer and his value as a mercenary soldier on wilderness campaigns [such as the military quests of Alexander] did not translate into archery being accorded athletic status among the Greeks; because the fathers of the Greek city-states wanted their sons to practice arts that would directly enhance their performance as heavy foot-soldiers in the defense or expansion of their homeland. The Hellenic martial artist was groomed to be a protector not a killer. The bow and javelin were feared weapons, the bow in particular. Apollo, Herakles, Odysseus and Paris of Troy were all feared archers and boxers of myth. The Kretans, renowned as mercenary archers, were also feared boxers. There does not appear to be any functional link between boxing and archery, but rather a metaphorical one. The boxer is likened to the archer who strikes from afar and dodges to avoid harm, just as the wrestler is equated with the heavily armed fighter of the line. There is some evidence that archeryor at least the flexing of the bowwas practiced as a body-building exercise by wrestlers. Flexing a bow would also provide useful exercise for a boxer seeking to balance his shoulder development to avoid chronic rounding of the shoulders, which is a common affliction among modern boxers, though not evident among the ancients depicted in art. Spear-throwing retained more relevance to the martial culture of Greece because it was combatable with the thrusting spear and the other gear associated with hoplite warfare. Although the Greek citizen himself would fight as a heavy foot soldier who thrust with his spear, his poorer countrymen, as well as soldiers hired from the high border-lands where hunting was still a common way of life, would provide the majority of the fire-power fielded by Greek armies. The wealthiest soldiers of the classical Greek city-states would ride into battle on horseback, often armed with light spears which they hurled from horse-back. Hence the character of military development did not marginalize the throwing spear, and spear-casting remained an admired martial skill for the entire period under discussion. Functionally, spear hurling might aid in the development of the muscles employed in the art of punching. However, it is just as likely that the javelin was not an art favored by boxers because of the danger of developing a chronic shoulder condition. The particularly demanding shoulder mechanics of the distance throw favored for sport and mass battle would make it an art avidly avoided by professional-level boxers, who, without the benefits of cortisone injections or rotator-cuff surgery enjoyed by modern athletes, would have to look to prevention as their means of defeating that ever-present specter of the athletechronic use-induced injury. From an Attic kelix, c. 560 B.C. This is an example of a functional individualized war art. An under-handed cast is a close-range dueling technique that exploits the thrower's shield as a means of concealing the timing and angle of the cast in order to foil the opponent's attempts to dodge, catch or deflect the shaft. For those who doubt the power of such a throw [in this case enhanced with a twisted casting cord] consider that female college softball pitchers throw 59 to 65 miles-per-hour at 43 feet which is equal [when the 17.6 foot range difference is calculated] to a 115 MPH major league baseball throw at 60.6 feet. As with the fencer's thrust, an underhanded throwing technique is also more accurate since the hand stays closer to the body than with an overhand throw. The monomakhaist has raised his lead leg to develop velocity for the cast. As with boxing, the momentum to insure a powerful technique originates at his base in his feet and will be transferred upward through the joints of his body to speed the javelin at maximum velocity. When he stamps down with his lead leg he will have triggered a momentum shift and the throwing spear will fly from his hand, with power and flight stability further enhanced by the added leverage and spinning motion imparted by the casting cord. *Information on throwing mechanics based on an interview with professional pitching coach Dan Funk on 12/9/04. From an Attic Kelix, c. 525 B.C. A highly evolved stylistic sport based on the casting techniques employed in mass battle. Casts for mass battle would be predominantly overhand but not for reasons of power or accuracy. An overhand cast was important in mass battle because it permitted casting from horse back; casting over the heads of companions in forward ranks; and more easily achieved a controlled angle of descent beyond an enemy shield-wall and forward troops into the exposed neck, collar and chest of reserve troops than did an underhanded cast. Again, the example of javelin throwing points out the importance of all Greek athletics as indirect methods for preparing citizen-soldiers for the crisis of mass battle. Athletic casts appear to have been rated for distance so long as they stayed within the boundary of the casting area, while equestrian casts were rated for accuracy.